Make fun of La Eace's artistry all you want. That's fine. Immature, but fine. 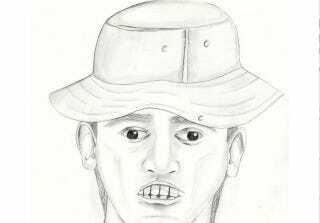 Just ask yourself first: Would anybody who's ever seen that chap not recognize him instantly, thus saving the 75-year-old woman who was "abducted in broad daylight from a busy open-air shopping mall parking lot" in Crestview Hills, Kentucky? Capt. Chris Schutte of Lakeside Park-Crestview Hills police suggests people shop in pairs and lock their doors when they get into their vehicles. "Obviously, you don't want people to be scared or paranoid, but it is always good to be vigilant," Schutte said. "If you see anyone suspicious, if you see anyone who just makes your gut go into a twist, go the other way if you can. If not, call 911." Security cameras capture the man driving the car into the parking lot of St. Elizabeth Covington hospital soon after he left the car's driver tied to a tree in Cleves on Tuesday. The suspect parked, got out of the car and walked away. He was not seen meeting anyone or getting into another vehicle.